Robert Robinson Taylor was the first African American to graduate from the Massachusetts Institute of Technology (MIT), along with being America’s first academically trained black architect. 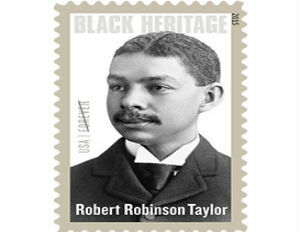 On Feb 11, Taylor was inducted into the Postal Service’s Black Heritage Stamp Series as the 38th honoree. Taylor was born the son of a former slave, on June 6, 1868 in Wilmington, North Carolina. His father became a successful carpenter and contractor, and taught his son about work and how to succeed in both industries. Taylor graduated from secondary school, worked as a construction foreman, and then left for Boston to study the architecture program at MIT in Boston in 1888. With an intense and rigorous schedule, he would spend up to seven hours each day in classes, and he went on to earn honors in trigonometry, architectural history, applied mechanics and differential calculus. At the time of graduation, he had been offered jobs by various employers to teach. Booker T. Washington invited him to work at the all-black institute he founded in Alabama, the Tuskegee Normal and Industrial Institute. Taylor accepted the position and began at Tuskegee in 1892, establishing himself as a leader in the architecture and carpentry worlds, and began to offer certificates in architectural drawing, helping grad students enter the programs and get hired in offices. His next project included designing and rebuilding the Tuskegee campus in a Colonial-style, which was disheveled upon his arrival. He oversaw construction, from libraries and dorms to new gyms and a chapel. In 1899, he left Tuskegee to begin building in Cleveland, returning back in 1902 to be given the title Director of Mechanical Industries which he kept his entire career. After retiring in 1932, he spent his final days in Wilmington, and died on Dec. 13, 1942 after collapsing in a chapel during a visit to Tuskegee. His influence has extended beyond his death, and the stamp is currently being issued as a Forever stamp, equal in value to the current First-Class Mail 1-oz price.